The Sumerians, the first "civilization" in Mesopotamia, the "Fertile Crescent." These people were not Semitic and were not indigenous (local) to the area, but came from the Indus Valley. They came to the Tigris-Euphrates Valley which was originally inhabited by tribes of Semites. The Epic of Gilgamesh was the first written epic poem and oneof the oldest pieces of literature in the world. It was a eulogy to Gilgamesh, King of Uruk. It was originally written on 12 clay tablets in cuneiform script. Gilgamesh, originally a Sumerian legend recopied by the Assyrians, was composed and recited many times before written down. It was part of an earlier oral traditional. Assurbanipal, the last great king of Assyria, sent messengers out to search the archives of the ancient seats of learning in Babylon, Uruk, and Nippur, and to copy and translate into the contemporary Akkadian Semitic those texts which were in the older Sumerian language of Mesopotamia. 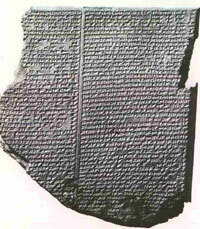 Amongst these texts, was the poem which we call the The Epic of Gilgamesh. how Gilgamesh went through every hardship. he is the hero, born of Uruk, the goring wild bull. and walks at the rear, trusted by his companions. raging flood-wave who destroys even walls of stone! The book describes how Gilgamesh, a king of Uruk, set out on a quest for knowledge and immortality.